Rian Hughes is a British comics artist, illustrator, graphic designer and type designer. As a comics artist he became known for his work on Dare,, an updated version of Dan Dare, written by Grant Morrison and serialized in Revolver; as well as Robo-Hunter and number of other features for 2000AD and other titles. At a time when highly rendered or fully painted comics were a big trend, Hughes forged a highly graphic, flat color approach in which design played almost as important a role as drawing. If not exactly in a direct lineage to the ligne claire school of illustration and comic art (see my post on Hergé), notably because of the frequent absence of lines, he was nonetheless a defender of the principles at the root of that style. Hughes was one of the early adopters of computer graphics for illustration and comic art, using Adobe Illustrator to create images in vector shapes. His style was very influential on illustrators in the 90’s and he continues to be widely noted for his distinctive approach. 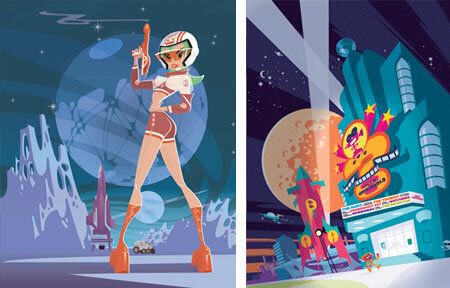 He was one of the earliest and most notable proponents of the “retro-60’s” style that has become prominent in illustration and animation (see my post on Ghostbot, creators of the familiar animated eSurance commercials). Hughes is also notable a graphic designer and typeface designer and is one of the most influential designers in comics industry. If you’ve ever noticed the high level of graphic design in DC Comics, for example, particularly as compared to the more pedestrian and cluttered design in Marvel’s books; a good bit of that influence is from Hughes. He was also instrumental in the design overhaul of a number of British publications lass familiar to American audiences. Hughes created many logos that comics fans will instantly recognize, as well logos for a variety of other clients. Hughes has been noted as a font designer and has designed numerous inventive and stylish display fonts, many created specifically for illustration, comics or design projects he was working on. (Must be nice to be that facile. Need a font? Design one!) You can see an overview of his fonts on Identifont as well as on his own site. Hughes’ website is called Device, (formerly Device Fonts), and features his illustration, comics work, logos, design and fonts, as well as an impressive client list and some short animations. Hughes’ site doesn’t include much of his comic book work as many would like, (comics fans may find much recognizable material in the Logos and Design sections, though). A new collection has just been published under the title of Yesterday’s Tomorrows (not to be confused with the book of retro-futrism titled Yesterday’s Tomorrows: Past Visions of the American Future by Joseph Corn and Brian Horrigon). There is an illustrated article about the book on the FirstPost site, and a more detailed review on Jog – The Blog. Carbonmatter is the web site name and professional nickname of matte painter and concept artist Dan Wheaton. Wheaton has worked as an illustrator, designer and creative director for a variety of companies in print and interactive design, but the real focus of his career has been on his love for movies and gaming, particularly those in which special effects play a significant role. This has led to his work as a matte painter and concept artist for companies like Intelligent Creatures where he was senior matte painter for films like Babel, Stranger then Fiction and The Number 23; Ubisoft where he worked on the award winning cinematics for Prince of Persia 3; and Rocket Science vfx; as well as freelance work for companies like Pepsi. He has recently landed his “dream job” and gone on contract with Industrial Light and Magic as a Digital Matte Painter. Wheaton’s web site has been revised and expanded since I last visited and his online gallery has a nice selection of his work from the film and gaming industries as well as some personal projects. The new additions to the gallery include some marvellously dramatic landscapes for Prince of Persia. 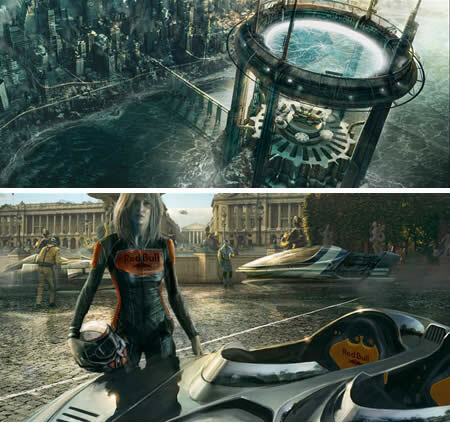 You can also see the influence of the great futurist and concept artist Syd Mead, particularly in images like Race Day (image above, bottom). This is one of my personal favorites. Wheaton has chosen as his background two buildings on the Champs Élysées in Paris which were used by architect Horace Trumbauer (who also supervised the design of the Philadelphia Museum of Art) as models for two nearly identical buildings, The Free Library and Courthouse, on the Ben Franklin Parkway here in Philadelphia. You can see a breakdown of steps in this painting on Wheaton’s portfolio on the CG Society site. Wheaton also has a gallery on the CG Channel. I’ve long been fascinated with the idea of comics and cartoons as a medium for instruction or teaching. Here’s an interesting take on that idea. 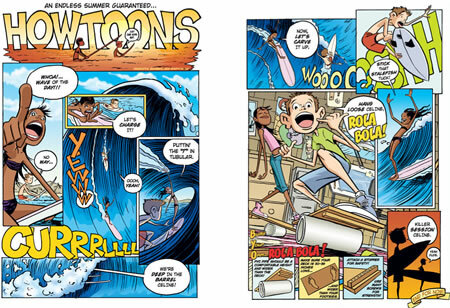 Howtoons is a series of how-to projects for kids (or adults going through a second childhood) presented as comic strips or cartoon-like panels. In them we’re introduced to Tucker and Celine, fantasy characters of brother and sister who are tired of watching TV and bored with video games (I did say fantasy characters), and so take to inventing “Tools of Mass Construction”; making playthings and learning projects out of clothespins, soda bottles, duct tape, cardboard and other kid-ready materials. Their how-to projects are collected as a book, also just called Howtoons, and are presented in a more limited collection online. The projects are sometimes presented as a comic strip and sometimes as a single panel, often accompanied by downloadable PDF’s that can be printed. Sometimes the printable PDF’s are the project, one of which is that great old standard of a zoetrope, one of the oldest and most basic methods of creating animation. Other online projects include a soda bottle submarine, a cartoon explanation of the Beaufort Scale (for measuring the force of wind at sea), and a “Rola-Bola” (image above). The site is rounded out with Library that includes articles on comic book artists like Kirby, Toth, Eisner and Herriman, and links to other related do-it-yourself or how-to sites (like the terrific Exploratorium), as wall as a nicely done set of links to Wikipedia articles about historical and contemporary figures who are Legends of art and invention. There is also a blog, where the contributors discuss their projects and other how-to and related resources on the web. One thing the site is lacking is a “Credits” or “About Us” page. The book is credited to Saul Griffith, Joost Bonsen and Nick Dragotta, with the illustration credits going to Dragotta, who has done some work for Marvel Comics. They apparently get a little help from Ryan McKinley and Phil Torrone. Flesk Publications is a small publisher specializing in art books, and particularly in titles that would be of interest to many lines and colors readers. I first wrote about Flesk two years ago as one of my first posts for lines and colors. At the time the focus of Flesk’s publishing efforts was on two of the greatest pen and ink illustrators ever to put pen to paper, Joseph Clement Coll and Franklin Booth. 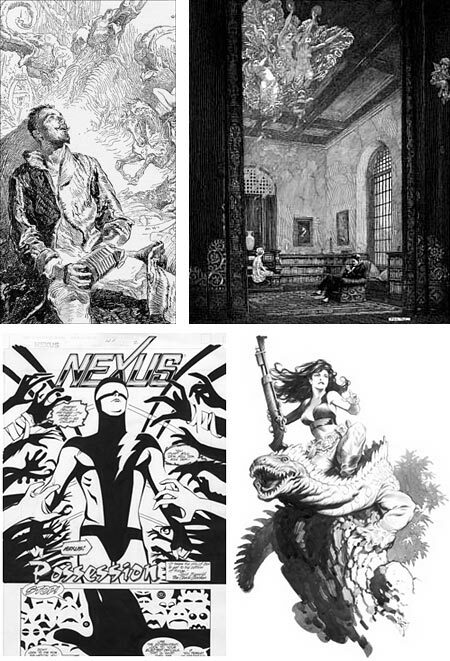 Since then, the line of titles has been expanded to include contemporary comics artists Mark Schultz and Steve Rude as well as illustrator and gallery artist James Bama. Flesk’s original collection of Coll’s work, Joseph Clement Coll: The Art of Adventure has been followed up with a second volume, Joseph Clement Coll: A Legacy in Line. For fans of pen and ink illustration (like myself) the publication of these two volumes was a major cause for celebration. Prior to that, the major book on Coll, The Magic Pen of Joseph Clement Coll, had been long out of print. There is a small gallery of Coll’s work on the Flesk site and an illustrated bio on BPIB. Flesk’s book on Booth, Franklin Booth: Painter with a Pen, has itself been out of print for a little while, but has recently been republished and is again available. For fans of this amazing illustrator, whose unique approach to pen and ink has never been duplicated, this book is an excellent collection and a nice compliment to Franklin Booth: American Illustrator, a title I have previously recommended from Auad Publishing. There is a gallery of Booth’s work on the Flesk site, though the Booth gallery on the Auad site is more extensive, with larger images, and and offers a better introduction to Booth’s work. There is virtually no redundancy between the Flesk and Auad books, and both are superb. Flesk has just released the third in a series called Mark Schultz: Various Drawings. All three editions are full of beautifully rendered drawings by this contemporary comics artist, whose work shows the influence of great comics artists like Wally Wood, Alex Raymond and Al Williamson. Due for release in November is a new book, Steve Rude: Artist in Motion. Rude is also a a contemporary comics artist, known for his work on Nexus, a very unique take on the idea of costumed heroes, co-created with writer Mike Baron. Rude also shows the influence of great comics artists and illustrators, like Russ Manning and Andrew Loomis. Flesk has also published James Bama: American Realist, again filling a gap for fans of this terrific illustrator and gallery artist. In the works are a book on Gary Gianni’s work on Prince Valiant and a new storybook by Schultz. You may still be able to pick up a copy of the recent issue of Illo, in which publisher John Fleskes interviews Mark Schultz. There are also short interviews with Schultz (also here) on the Flesk site about the book projects. There is a 2006 interview with Fleskes by Bill Baker on World Famous Comics. Fleskes also mantains a blog with infor about the Flesk Publications projects and other topics of related interest. There a separate News section on the site. OK, big news flash here, in case you weren’t aware of it, but artists, even good artists, don’t necessarily know squat about graphic design. (Gasp!) Yes, true fact: art and design are two different skill sets, even though there is some cross over. Sorry if I’m stepping on any toes, but if you want proof, look no further than the endless array of horribly designed artists’ web sites already out there. To make matters worse, traditional print designers, even good ones, don’t necessarily know squat about web site design. Again, it’s two different skill sets, though the overlap is much more extensive. Print designers, if they know their craft, can specify a page design that turns out in print precisely as they designed it, with pinpoint placement of graphic elements, total typographical control and exactly specified colors. The web, on the other hand, still offers very limited typographical control; color space and page size vary between operating systems and individual computers; and even web pages designed by pros, that once looked fine across the board, can go wonky with the newest release of the most popular browser from The Giant Software Company That Shall Not Be Named. The web is wiggly and squirmy, and designing for pages that can be different sizes and shapes on different computers is a little like eating Jell-O with a fork; it can drive stout-hearted print designers to madness and acts of desperation. You have some of the same alternatives I mentioned in my article on Building your site, notably hiring a professional and using, or starting with and altering, existing page templates. I can’t give you a course in design here, but I can try to point out some important considerations. Here’s where web design gets all twitchy right off the bat. Unlike print design, you don’t know the final size or shape of the area in which your design will display; it varies from computer to computer among those viewing your site over the web. EEK! This understandably drives long-time print designers completely crazy, and they will very often make their pages un-web-like by freezing them at a set width and height, or popping them up in a specifically sized window, and otherwise trying to make them behave like print pages. This is one option if it makes life easier for you, but I think it’s better to approach a web page as a web page and take advantage of the fact that it can shrink and grow to accommodate different amounts of content. Web design has lots of advantages over print design, it’s not all disadvantages. While you can’t predict the exact size in which viewers will be seeing your pages, you can predict the most likely “window”, based on statistics. Most people are viewing the web in one of several common screen resolutions. The most common, as measured in pixels, are: 1024 x 768, 800 x 600 and 1280 x 1024, in order of current popularity. These figures change over time as more people buy larger monitors. Up until a couple of years ago, I was designing for 800 x 600, but smaller monitors are giving way to larger and I now design sites to display comfortably in 1024 x 768, and try to nicely accommodate the way they will look in higher resolutions. Taking into consideration typical “browser chrome”, the space taken up by the browser interface and all its wonderful widgets and tool bars, and allowing a little extra wiggle room, I work within a “safe” size of 980 x 550. The page can be longer vertically, of course, but that initial size before the user starts scrolling (if they take the trouble to scroll) is the most important. Try to keep your most important content, navigation elements, etc. “above the fold” in that window. (“Above the fold” is a reference to the front page of newspapers, in which the most important stuff has to be seen when the papers are folded in half on the stack.) You may want to leave more or less in terms of horizontal margins. On larger resolutions, the background will expand to fill out the difference. Remember in designing your page elements that you don’t want to force part of your main image gallery display, or the gallery navigation, below the bottom of the window so users have to scroll to see or use it. The content area of your design can either change width with the window width (“fluid”), be a set width, locked to the upper left (“ice”), or be a set width that floats to the center of the window, with the background expanding or contracting to either side (sometimes called “floating ice”). The first is the hardest to implement, the second the easiest, and the third is currently the most popular design structure. Think of a web page as a grid. You can make it as curve-u-licious as you want, but it’s going to have a rectangular grid underneath it, and you need to make your curves work within that structure. You’d be surprised at the number of high-end sites that are based on a few simple elements with some graphic design embellishments. Try starting with a top bar or banner, a horizontal space across the top of the site containing your “logo”, name or the name of the site, and maybe an image element. Under that arrange a navigation area, perhaps horizontal if your site is very simple, or a vertical column to allow for subsections and expansion, and a content area with your page heading, text and images. If you want you can tie the bottom of the page off with a horizontal footer, usually containing a copyright notice or contact information. Ah-ha! you say. Consistency is the hob-goblin of little minds! Perhaps, but on the web, it’s the guardian of clarity and your best defense against confusing or discouraging your visitors. At any given moment after a visitor opens your site, they should be able to glance at page elements and know: What site am I on? What page within that site am I on; and where am I in relation to the other pages (or major sections) in the site? Headings (page titles) and sub-headings should look the same, and be in the same position on every page. Sub-headings should be clearly subordinate to headings. If you have a footer, keep it consistent. While there may be variation within your consistent page layout (a text page for information About the Artist will be different from a portfolio or gallery page, for example); the one page that can be dramatically different from the others is the home page, which acts much like the cover of a book or magazine. It should have some continuity, in that it should look like part of the same web site, but it doesn’t have to follow the same pattern as the interior pages, and in fact, should look different so users can distinguish it easily as the home page. It also serves like the lobby of a building, from which visitors can orient themselves. Put it somewhere users expect to find navigation (usually toward top or left). Make it look like navigation. Ideally, highlight the navigation element for the page or section they’re in as a sort of “you are here” indicator. Every page but the home page should have a link to “Home”, preferably as the first navigation element. Every page should have access to all of the major pages or sections. If you’re in a sub-section (e.g. “Portfolio”), every page in the sub-section should have access to every other page in that sub-section, as well as to the main site pages. Don’t make them use their “Back” button, or your own version of a “Back” button (like “Up” arrows, etc.). This is a web site, not a directory on your computer. I’m not a big fan of “pop-out” or “drop-down” menus. I think it’s a poor substitute for visible hierarchical menus. Lots of people love them, but then lots of people love Michael Bolton and Yanni, I’m just not one of them. For more on navigation concerns, see Donâ€™t Make Me Think: A Common Sense Approach to Web Usability by Steve Krug. Start looking at sites you visit with an eye toward which ones are easy to navigate, and which are not, and see if you can understand why. Color can be as personal as clothing choice, and likewise will impact the immediate (and perhaps lasting) impression made on others. The most important piece of color advice I can give you is to remember the purpose of your site. Don’t choose a color scheme that will overwhelm, conflict with, or otherwise detract from the display of your work. 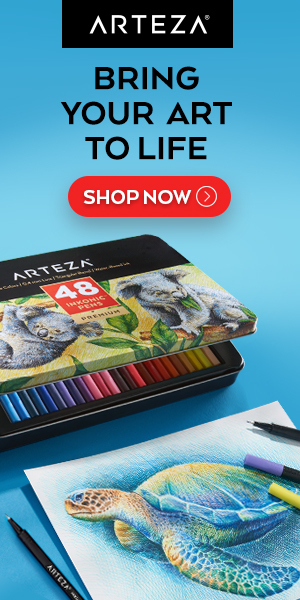 This may often mean using low-chroma, neutralized colors or even grays, or choosing colors that compliment the predominant colors in your work. But, hey, if you think a background of electric green or baby-puke yellow will set off your work to best advantage, go wild. Back when web site design was a fledgling art, the major software companies were clueless about our need to access the palette of colors that would display reliably across different operating systems, particularly when one of them was often running on machines with a very limited ability to display colors. (Older Windows computers could often display only 256 colors.) So we were left with third party utilities to choose colors from the small palette of 216 colors common to the two systems. Now that almost all computers can display millions, or at least thousands, of colors, the major software companies are once again displaying their ignorance by acting as if the web safe palette is this wonderful web-aware feature they’re providing for you, when it essentially no longer matters! If you are trying to match the edge of a flat color in a graphic or Flash file with a background color set by hex code in the HTML, it can be helpful to use a color from the web safe palette; otherwise use the colors you want. Be aware that your site will look different on Mac and Windows machines. They have a different “gamma” settings, and colors will generally look darker on Windows than on the Mac. Image editors like Photoshop and Fireworks have provisions for previewing your work in the other system’s color space. If CSS has brought web design out of the stone age and up to Victorian levels of technological sophisitication, web typography is still in the medieval dungeons and is the domain of witches and demons. The problem is that your “live” text has to display in a font (typeface) that exists on the user’s machine. You can specify any font you want, but if the user doesn’t have it on their machine, the browser will default to whatever it can find, sometimes with unpredictable results. This is another thing that drives print designers crazy and I don’t blame them, it’s a terrible limitation that leaves very few font choices. The best universally installed fonts are Verdana, for sans-serif body copy, Trebuchet MS or Arial for sans-serif headings and Georgia for serif. In general serif fonts don’t read well at small sizes on the low resolution of a computer screen. Verdana, Trebuchet MS and Georgia were specifically designed for display on screen rather than in print. Avoid things like Times New Roman, and surpress any temporary possession by demons that may make you think about using Comic Sans. I can’t give you a whole primer on web type, but I often use 11px Verdana for body copy, 12px Arial or Trebuchet for subheadings or text-based navigation elements. Your milage may vary. Page headings and navigation elements can be created as graphics, allowing you to use any font and restoring full typographic graphic control to at least those areas. Be sure to use image “alt” tags in the HTML for those images for the benefit of search engines. Don’t use more then three different typefaces. Here is an area where some big-time web usability gurus (Jacob Neilsen are you listening?) fall flat on their faces, in apparent ignorance of one of the most fundamental rules of graphic design (and one that has been known for literally hundreds of years): human beings read text more easily if it is constrained to a certain width. The general rule is about two alphabets, 50 or so characters, which is approximately the width you’ll see in most hardbound novels. This is the primary reason that magazines and newspapers have columns, though selling ads is a close second, and in newspapers columns are broken down to even smaller widths to make it easier to sell small ads. More than that, it’s a page’s highway system and tour guide, the way you move someone’s eye around the page. White space is one of your most powerful design tools, and the proper use of it is one of the quickest indicators of high end design. (“White space” doesn’t have to be white.) Look at the most appealing professional sites and note the amount of space in the design that is “empty”. You’ll notice the same thing in newspaper and magazine ads. The really high end ones will appear to “waste” a lot of the very expensive ad space, but are actually using it to control your eye and attach importance to the highly focused message. Give your text columns plenty of room to “breathe”. Even artists who understand the concept of “negative space” in painting and composition may not grasp its importance in design. What is not there, Grasshopper, is often more important than what is there. Make sure it’s clear what is and is not a link. Don’t use colored text except for links and headings. Never underline anything on a web page that is not a link. Use bold or italic (sparingly) for emphasis. Don’t center your text! Unless the site is one big wedding invitation, never center anything that is not a headline. For some reason, perhaps exposure to too many Microsoft Word documents, a large number of people suffer from the delusion that centering text makes it look more professional, when in fact the opposite is true. Don’t use italics for long passages, like centered text, it’s hard to read. Like artists learning to draw by studying the masters, one of the best ways to learn about web site design is to look at existing successful designs. I’ll list some sites below that are large indexes of sites that someone thinks are well-designed. This, of course, is always a matter of opinion, but you will certainly find a higher percentage of well-designed sites here than on the web in general. And a big list (Under Creativity, CSS Showcases and CSS Galleries) of many more design inspiration sites on Web Developer’s Handbook, along with a ton of links to other web design and building resources. 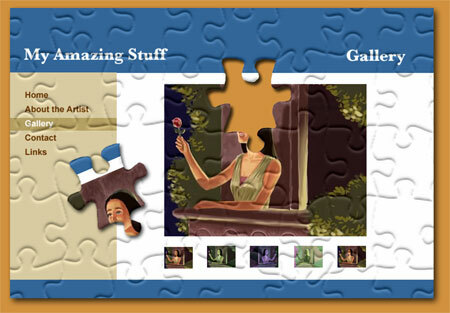 Here are a couple of design resources for “stuckness” from The Crafted Webmaster. In addition to the above links, I’ll send you back to the same resources listed in the articles on Planning your site and Building your site which have information relevant to design issues as well. Armel Gaulme is a French illustrator and graphic designer living in Paris. The bio on his site is very brief, but emphasizes that his love for painting and illustration, and the study of artists whose work he admires, has carried him farther than his formal academic training, though he continues to pursue courses at the Ateliers des Beaux-Arts and the Duperré School. 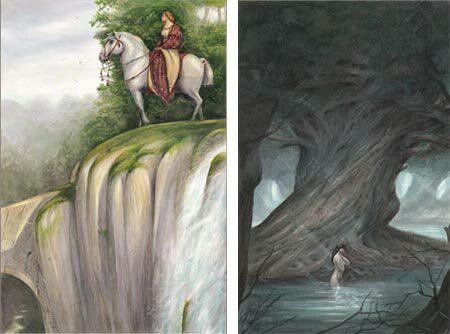 There is no client list on his site, but the names of books that he has illustrated and collections (albums) of his work are included under the images. Unfortunately, they don’t seem to be directly available in the U.S. but you can see a selection on Amazon.fr. When looking though his online galleries, be aware of their multi tiered nature so you don’t inadvertently miss things. Within the categories and sub categories at the top of the page, there are third-level tabs at the left of the image space, and the rows of thumbnails have “Prev” and “Next” buttons to additional screens. Also there is a bio and list of links tucked away in the “Contact” section. Interestingly, the text portions of his site are in English. Gaulme has a nicely imaginative approach, in a variety and sometimes mixture of media. Occasionally his pieces are accompanied by preliminary sketches. There are also sketches and drawings in their own sections. Though many of them are quick suggestions and gesture drawings, some are carried to a high degree of finish as works in themselves. Gaulme is still fairly young, and I think we’ll be seeing more from this talented illustrator in the future, hopefully on both sides of the Atlantic.